This week, screenwriter and comics creator Geoff Thorne stops by to talk about his latest project, an indie comics cage fight of sorts. 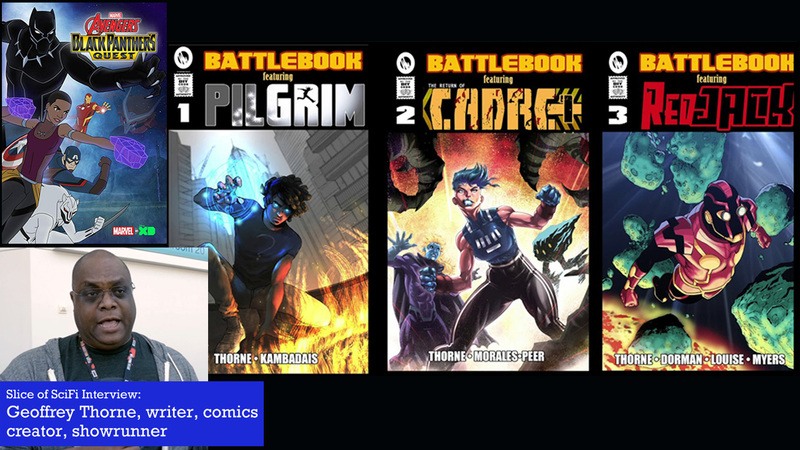 BATTLE BOOKS is a unique project, a comics free-for-all where the fans and readers determine which hero’s story gets to proceed beyond Issue #1. Geoff talks about the backgrounds of how these heroes and their stories came about, how he wanted to have a certain style to them, his ideas going forward with these and new stories, and his vision for future BATTLE BOOKS and producing digital comics in general. Will PILGRM, CADRE ONE, or REDJACK win their chance to continue? Read for yourself, and hopefully the story you want will get to full series! You have until March 20 to weigh in for your purchase to count towards keeping that series going. Geoff is also the showrunner for the new animated “Marvel’s Avengers: Black Panther’s Quest”, currently airing Sunday nights on Disney XD, and he talks about his vision for the show, the freedoms he was given by both Marvel and Disney to break away from many of the usual animation storytelling restrictions. It’s a wonderful story so far, and not only should you be watching, you should be clamoring for Disney XD to air the episodes more than once a week! Where do you look for the comics that excite and inspire you? Let us know! Call 602-635-6976 and leave a message, send Summer an email, or have your say in the comments below!